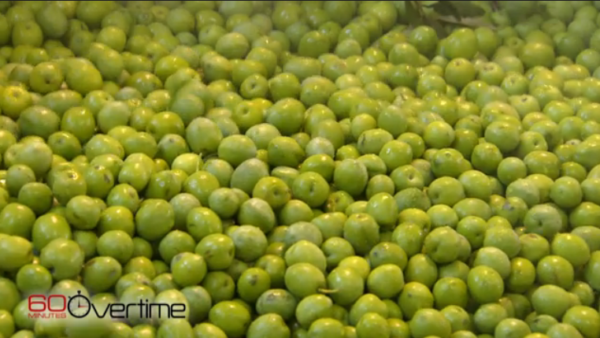 A recent segment on CBS’s 60 Minutes focused on how heavily involved the mafia is in Italian olive agriculture. For many millions of people who watched the segment, it was the first they’d ever heard of the “underworld” associated with the Italian olive oil trade and the “Made in Italy” brand label. The segment included in-depth conversations with an Italian special investigator, Sergio Tirro, as well as an interview with Tom Mueller, who wrote an expose called Extra Virginity about the issue. Tirro’s team included 60 trained olive oil tasters, who were able to pinpoint counterfeit olive oils at the first sip. The mafia has begun to specialize in creating copies of fine wines, olive oils and cheeses as part of a ring of organized food crime throughout Italy. In many cases you are getting much lower grade oil that has been blended with some good extra virgin olive oil to mask the lesser quality. In other cases, it’s simply been deodorized and blended with another more colorful, flavorful oil. Regardless of the processes being used, the oil is then sold with an “extra virgin” label, which is illegal, yet extremely common. According to Tirro, sometimes the oil being sold doesn’t come from olives at all, Simply taking a vial of sunflower oil and adding a few drops of chlorophyll can give the mixture the appearance of extra virgin olive oil while it’s in the bottle. One olive oil producer in Sicily has attempted to band regional olive farmers together in a resistance against the criminals, but his efforts have been met with violence. According to the olive oil producer, mafia members burned his car and part of his home while he was inside, the same day he announced plans to resist the growing movement. It was an eye-opening report that showed consumers need to be very careful about the oils they purchase off store shelves. “Extra Virgin” oil “Made in Italy” might not actually qualify for either of those labels. By purchasing olive oil from My Olive Tree, you can be sure your money is going to help support humanitarian aid work throughout Israel. Contact us today for more information about how our oil is made and where your money goes.